Experts have raised warnings about the weaknesses of Vietnam's exported shrimp including unfavourable colour and antibiotic residues which could lead to Vietnam losing markets. A recent survey conducted by the local authorities in Phu Tan District, Ca Mau Province, about shrimp raising and wastewater treatment showed that only 53 out of 119 shrimp farm owners followed wastewater regulations. This is a common issue across Vietnam. At a meeting about shrimp raising in HCM City, Le Van Quang, deputy head of Vietnam Association of Seafood Exporters and Producers and chairman of Minh Phu Seafood Corporation, said that too many antibiotic residues were Vietnam's shrimp export weakness. Many markets including the US, Japan and the EU have tightened regulations about antibiotic residues. In the past, only 30 percent of Vietnamese shrimp cargoes were inspected, but now all of them are inspected in Japan. South Korean authorities have sent two official documents to warn over Nitrofurans residues in shrimp. The future of shrimp export to the EU is very dim and if the problem is not solved, Vietnam may lose access to those markets. "The cost for antibiotic residue testing is not cheap. Minh Phu Seafood Corporation has invested in several VND10bn (USD427,000) laboratories. As a result, the price for a kilo of shrimp increased by VND6,000 and this will make Vietnamese shrimp less competitive," Quang said. In addition, boiled shrimp from Vietnam has a pinkish colour while most markets prefer them red. "Famers often wait until the shrimp are 30-50kg to harvest. This leads to an excessive amount of shrimp of certain sizes while the markets lack other sizes," Quang said. Last year, shrimp output in India reached 600,000 tonnes. However, due to low shrimp prices in early 2018, many farmers started a new season late or switched to other jobs. The US imported 33% of Indian shrimp and has started increasing the amount of imported shrimp since September. 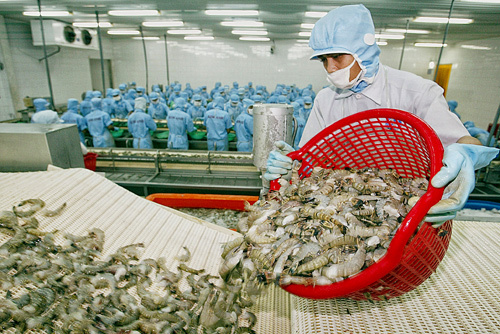 As the world shrimp prices have started picking up, Vietnamese firms will have more chance in the US due to the trade war with China and lowered anti-dumping taxes on Vietnamese shrimp and catfish. China has also lowered taxes for seafood from ASEAN countries. Vietnam used to export 300,000 tonnes of shrimp to the US annually. However, tightened regulations from December 31 means more challenges for Vietnamese farmers and firms. Farmers are advised to co-operate with others and firms to improve shrimp quality.